Tanasi (pronounced tah-nah’-see) is the origin of the word Tennessee. Tanasi was the name of a large Cherokee village located in what is now Monroe County, Tennessee, on the banks of the Little Tennessee River (known to the Cherokee as the Callamaco River). Tanasi served as the unofficial capital of the Cherokee nation in the early 1700s. The Tanasi Arts and Heritage Center was created to showcase Tennessee mountain arts, crafts, music, drama, dance, literature, history and heritage, food, and natural beauty. The Center is being developed in two phases. The planned Center facility is pictured above. The building will have an interpretative area telling the story of the mountain arts. Guest studios will provide regional artists and craftspeople with a space for working and displaying their creations. Special exhibits will depict the customs and life of the Tennessee mountains. The temporary home of the Tanasi Center, pictured below, is within sight of the Center’s future facility. It is housed within the Town of Unicoi’s newly developed Unicoi Tourism & Information Center. 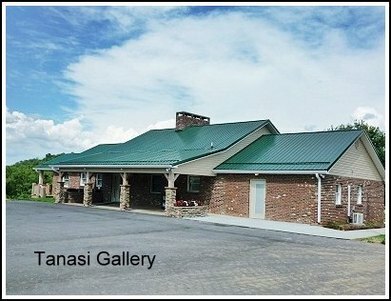 There, a Tanasi Gallery displays regional arts and crafts for sale. Periodic demonstrations such as painting, pottery, wood carving, weaving, and broom-making will be held on the grounds of the Tourism & Information Center. The County and Town of Unicoi derive their name from the Cherokee word “unaka’a,” meaning “fog-shrouded”—and indeed the mountains in this area, within sight of the Great Smoky Mountains, often display wisps of fog and a mantle of low-hanging clouds. Unicoi offers the peace and tranquility of a small mountain community within ten minutes of the shopping, restaurants, arts, and services of Johnson City and within twenty minutes of historic Jonesborough, Tennessee, home of the International Storytelling Center.